Whilst waxing lyrical on their anti-Brexit, pro-immigration and pro-gender equality point of view, this latest album finely balances a no-holds-barred agenda with an overarching sense of fun, peppering their defiant anthems with a sense of humour, lyrical in-jokes and buoyant, singable choruses. 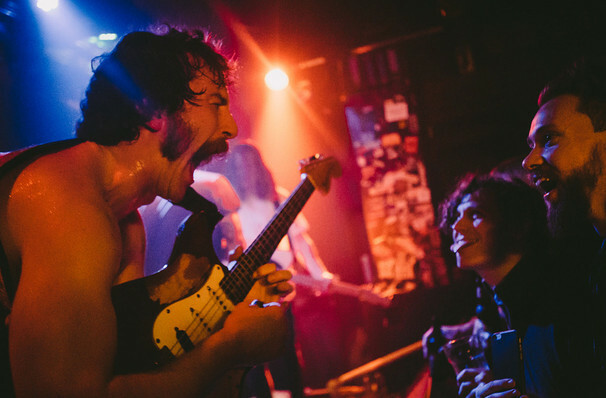 As such, they put on a raucous live show where front man Joe Talbot's boundless energy and wide-eyed, on-stage growling evokes mosh pits, mass sing alongs and general rock and roll bedlam. Seen Idles? Loved it? Hated it? Sound good to you? 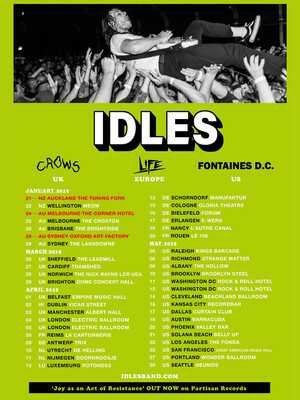 Share this page on social media and let your friends know about Idles at The Earl. Please note: The term The Earl and/or Idles as well as all associated graphics, logos, and/or other trademarks, tradenames or copyrights are the property of the The Earl and/or Idles and are used herein for factual descriptive purposes only. We are in no way associated with or authorized by the The Earl and/or Idles and neither that entity nor any of its affiliates have licensed or endorsed us to sell tickets, goods and or services in conjunction with their events.